Due to the amazing support of our watercolor loving friends, our first 2017 Limited Edition Schmincke travel tin (Botanical, colors chosen by Marilyn Garber) sold out in record time. We were encouraged by the phenomenal interest (and ongoing requests) to put together a second set for 2017, which seemed appropriate given 2017 is the 125th Anniversary of Horadam Watercolors. As part of the anniversary celebration, Schmincke updated the color selection of their watercolors. We lost a couple colors entirely to the raw materials no longer being available – Walnut Brown and Pozzuoli Earth, RIP. A few colors just got new names and a few got replaced with similar pigment formulas, so have both new names and reference numbers. For full details on the changes to old colors, see this pdf from Schmincke: What’s different in the new assortment. The most exciting thing about the new assortment, of course, is 35 New Colors. The new Horadam colors run the gamut – they include historical pigments, transparent earths and modern colors. We decided to put together a split primary palette that not only introduces you to these new colors, but also allows you to create magical mixes for a range of subjects. As with the Botanical set earlier in the year, this selection of 12 colors will be in the squarish tin that holds a total of 18 half pans…which leaves 6 spots to customize the palette to your tastes or outfit with your favorite go-to colors. *winkwink* We have free shipping at $99. Important Notes: We have confirmed shipment from Germany, but our lovely sets are on the slow boat. Barring any issues with customs, we hope to see them by mid-October and are now taking preorders. There are two duplicate colors with the Botanical set – Cobalt Azure and Perylene Green. We will not be making changes or substitutions to the colors in the new set. In addition to the new sets, we expect to see dot sheets back in with this import shipment. We anticipate a heavy influx of orders for this set – they will be processed in the sequence they are received. Order fulfillment may be longer than usual due to volume, once they arrive. Want to expand your set with more new colors? Want to browse all of the Horadam half pans? Want the awesome gel pen that I used as a resist in the color swatches? Thank you to all of our water-media, Schmincke-loving artist friends. We could not make these unique items happen without your patronage. Categories: News, This just in! New products we are excited about, Uncategorized | Tags: exclusive watercolor set, Half-pan watercolors, Kate Katzer, Schmincke, Schmincke half-pan watercolor set, Schmincke Horadam, watercolor, watercolor set, Wet Paint St. Paul | Permalink. We’ve just wrapped up our big Sidewalk Sale and the fabulous Painting Best Practices workshop (thanks again to George and Tatiana from Natural Pigments and Jim and Sarah at The Art Academy! ), and now we have a minute to catch our collective breath before the craziness of back to school is upon us. What better time to reflect on all the cool, new stuff that’s arrived at Wet Paint recently? – The 46 brilliant colors of Amsterdam Acrylic Ink are highly pigmented ink, extremely lightfast, and waterproof when dry. It has been flying off the shelf since it showed up a few weeks ago. Check out this teaser video to see why. – Ecoline Liquid Watercolor just arrived. The brilliant, dye-based colors are super intense, super transparent, and – of course – super water-soluble. Super sweet 30ml glass bottles enhance the presentation. – To go along with the Liquid Watercolor, we’ve also brought in new Ecoline Brush Pens (the display is en route to Wet Paint at press time). These contain the same Ecoline Watercolor in a hearty, economical brush pen that’s great for making sweeping, gestural marks or teeny tiny details. Can’t wait! One of the big hits from our Holiday Sale was a series of Paper Toys books from Ginkgo Press. We just received a huge order of these and there are new titles! These interactive craft books allow children (or the young at heart) to pop out and build their own paper toys. Each volume in the series is designed by a different talented artist, lending a stylized look to their fanciful creations. Animals, Monsters, Robots, and Fantasy Creatures, themes are now joined by Super Heroes and Speed Demons. Printed on durable cardstock and die-cut, each toy is easy to assemble with no glue or scissors needed. – We’ve already sold out of our first order of Pilot Kakuno fountain pens, but – never fear – we got more. This simple, beginners fountain pen is a favorite of new and seasoned writers alike. – Pentel’s Libretto matching rollerball pen and pencil set makes the perfect gift for the sophisticated professional and the conscientious student alike. These nicely weighted utensils feature sleek metal barrels available in three colors and accented in elegant silver trim. – Also from Pentel, the Tradio refillable fountain pen (not to be confused with the Tradio non-refillable fountain pen) is a stylish and sophisticated, yet affordable, writing & drawing tool. The medium size stainless steel nib allows the ink to flow with smooth control. The Tradio accepts your favorite International style cartridge, so the world’s your oyster when it comes to ink colors! Blackwing Pencil fans, come on down…we just received a very limited number of the new Blackwing 73. The 73 features a silver ferrule, a white eraser, and a vivid blue finish with a raised texture that mimics the topography of Lake Tahoe. The number 73 references Lake Tahoe’s last measured Secchi depth (a unit to measure clarity) of 73 feet. The 73 has the soft graphite found in other Blackwing pencils. You know what would go nicely with your new, blue Blackwing 73? How about a new Hahnemuhle Skizze pad with an eye catching blue rooster on the cover? We’ve got ‘em in two paper weights, two sizes, and gummed or spiral bound. Nice paper, nice look…perfect for sketching at the Minneapolis Sculpture Garden. Also check out the new hardbound Hahnemuhle watercolor books and Grey Books, the plain or ruled Diary Flex, and the back-in-stock-at-Wet Paint Quattro square watercolor blocks. Our friends at Tara Fredrix have launched their latest and greatest new idea: toned canvas in pads and panels. Now you have more time to paint…no need to tone your own canvas first! Available in four “go to” colors in a variety of sizes. Strathmore has added three new titles to their popular “Learning Series” instructional books: Textures in Colored Pencil, Draw Nature with Colored Pencil, and Hand Lettering Basics. The Strathmore Learning Series incorporates step-by-step art lessons, developed by the most popular art instructors, into a pad of quality Strathmore paper. Online video tutorials for each pad create an integrated learning experience that help beginning and experienced artists explore a new art style. Lastly, the biggest, newest single item at Wet Paint is already almost sold out – the Botanical Illustration set of Schmincke Horadam ½ pan watercolors. Based on the overwhelming response, our friend Marilyn Garber picked some good colors! If you haven’t already picked one of these up, run – don’t walk – to your phone, screen, or transportation device! So…no official proclamations imbuing royalty, just lots of excitement around the new creative supplies at Wet Paint! Categories: In depth with Darin, This just in! New products we are excited about | Tags: hahnemuhle, new product, Palomino Blackwing, paper toys, Pentel, Pilot, Royal Talens, Schmincke half-pan watercolor set, Strathmore Learning Series, Tara Fredrix, Wet Paint St. Paul | Permalink. This holiday season we are featuring some of the unique, creative supplies that are regionally, or nationally, exclusive to Wet Paint. These items are great gift ideas that you will not find anywhere else. We’ve talked about the Custom Schmincke Horadam Watercolor Set a lot since we got them in last year, but if this is your first time hearing about it, (or 7th) you know that we LOVE Schmincke and this set is an excellent intro to the Horadam Watercolor line. Extremely moist watercolors in a classic metal tin. This custom palette features a selection of six split (warm & cool) primaries, and six secondary & mixing colors. Our most popular item at Wet Paint is indispensable for the painter, sketcher, designer or architect. Already have the set? 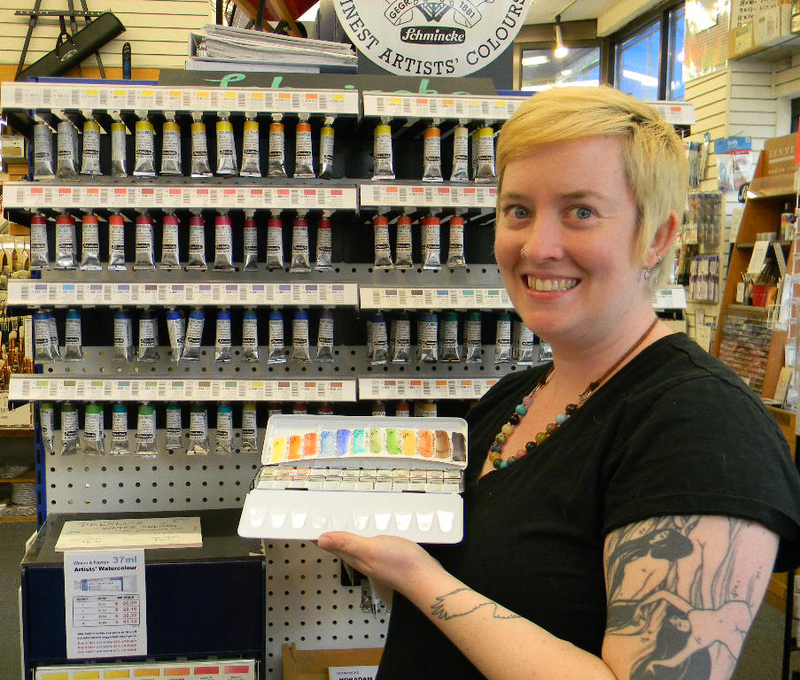 Wet Paint staffer, Liz, will be doing a Color Chart Class with this set that would be a great add-on gift for anyone wanting to see what this set can do! Click here for more info! Categories: This just in! New products we are excited about | Tags: holiday catalog, Only at Wet Paint, Schmincke half-pan watercolor set, Schmincke Horadam, Wet Paint St. Paul | Permalink. If you have shopped at Wet Paint in Saint Paul during the past 25 years, you know Darin Rinne, our General Manager. And you know Darin loves to tell a story. And I’d bet he’d tell you his favorite story is about the Schmincke Half-pan Watercolor Set. About 10 years ago, the U.S. importer of Schmincke color offered Wet Paint a deal on their 12 color half-pan set. We could give our customers a professional grade watercolor in a metal box at a comparable price to the competitor’s student grade in plastic. The only hitch, we had to purchase 100 sets. At the time, it was a big investment for Wet Paint, but we went for it anyway. The set was such a success; we ordered the set 3 times. Each time, the tin was a slightly different model. The fourth time around, no more were available. The story continues and now Schmincke has a new importer in the U.S. but no watercolor set we felt met the criteria for our customers. Marcus from Schmincke in Germany came to visit us in 2011 and asked how he could improve their relationship with Wet Paint. Darin and Greg Graham, our Floor Manager, worked with Marcus to put together a selection of warm and cool colors of their choosing which would be affordable and still a workable palette. They found an appropriate tin with space to fit another 6 colors for expansion. We worked with other independent art supply stores to meet the manufacturer’s custom run commitment. The set was so well received by our customers, that we needed to order more custom runs. And we worked again with Marcus to develop a Schmincke Gouache set to complement the watercolors with a palette selected by our friend Roz Stendahl. As we started seeing the end of our inventory, Schmincke informed us our tin was no longer available. Being such a successful program, Marcus and Darin worked up a 2013 edition which just got shipped to Wet Paint last week. Liz Carlson, urban sketcher and Wet Paint sales associate, got into the act by creating a new palette of colors for the new edition. The colors in the 2013 set are more transparent than the original selection. It is a stand-alone palette of colors but has no duplication from the original selection. The new tin is a longer box that has enough room to hold a standard length brush (or a pen) or 2 travel brushes. And it comes with 12 empty half-pans. So a painter could include the colors from their studio palette, include the colors from the original Schmincke Half-Pan Set or expand their palette in a completely unique way. 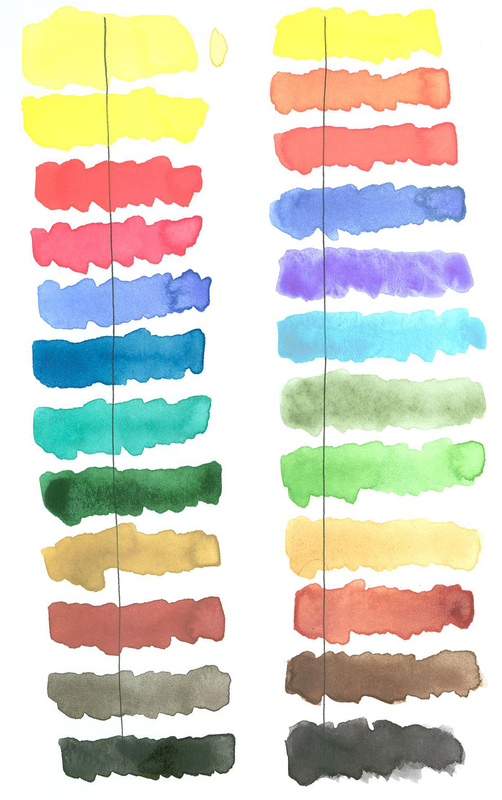 The new 2013 Schmincke Half-pan Watercolor Set! Kate Katzer, Wet Paint’s framer and web sales associate, is very excited, almost giddy in fact, about the new Schmincke Half-Pan Set’s arrival. She has a number of web customers disappointed they missed the original set. She likes the fact that the palette of colors is chosen by a working artist rather than a marketing department. Liz Carlson’s color selection is appropriate for the plein air painter, the sketcher, landscape painter or portrait artist. The colors are for warm weather, vibrant and fresh. There is a story behind each color selection. For example, Liz picked Mountain Blue because “it isn’t as bossy as Ultramarine.” She likes Cobalt Turquoise and Transparent Orange because they mix well to make great middle tones. Wet Paint is pleased to offer our customers the 2013 edition of the Schmincke Half-Pan Watercolor Set. Schmincke makes the best half-pan watercolors on the market. We have made a unique color selection you won’t find anywhere else. This set is priced ridiculously well. And the box wraps it all up as a beautiful object in itself. This is a watercolor set for those with great taste and an understanding of value & quality. We have worked hard to bring you a unique, professional grade product at a very affordable price. Visit our website to purchase and see the entire list of colors in this set! Categories: This just in! New products we are excited about | Tags: exclusive watercolor set, Half-pan watercolors, Kate Katzer, Liz Carlson, Roz Stendahl, Schmincke, Schmincke half-pan watercolor set, Schmincke Horadam, watercolor set, Wet Paint St. Paul | Permalink.